Oriyarasoi - The cosmopolitan Odia's Kitchen ! : Its Raining - Awards!!! I was recently bestowed with these lovely Awards by Mugdha of (COOKING FUNDAS). She has a lovely glog with authentic oriya stuff and very good non-vegetarian recipes. Do visit her. 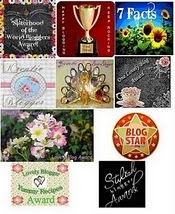 Passing on the awards to my fellow bloggers!!! 6. Melange - Mélange !! 12. Archana - The Mad Scientist's Kitchen!! Congratulations to all of you for being so lucky! Happy blogging!! Congrats on all ur awards dear and thanks for remembering me and passing them..
Congrat , dear , many more awards will come, you are a super cook with the authentic Oriya recipes..